The nation's homeland security chief on Tuesday ripped into members of Congress who have opposed the Trump administration's aggressive crackdown on immigration, telling lawmakers they needed to reshape federal law or simply pipe down. John Kelly, a former Marine general, delivered the tongue lashing during a speech at George Washington University, his first major address since being confirmed as Homeland Security secretary in January. "If lawmakers do not like the laws they've passed and we are charged to enforce, then they should have the courage and skill to change the laws," said Kelly, whose agency oversees the federal agents tasked with airport security as well as detaining and deporting people who are in the country illegally. "Otherwise they should shut up and support the men and women on the front lines." He continued: "My people have been discouraged from doing their jobs for nearly a decade, disabled by pointless bureaucracy and political meddling, and suffered disrespect and contempt by public officials who have no idea what it means to serve." International travelers are greeted as they arrive at John F. Kennedy international airport in New York City, U.S., February 4, 2017. Massachusetts Institute of Technology student Kiki Rahmati, from Iran, cries as lead attorney Susan Church greets her at Logan International Airport in Boston on Feb. 3, 2017. She was initially not allowed to enter the US after President Donald Trump's travel ban. A relative of Fuad Sharef, an Iraqi with an immigration visa who was prevented with his family from boarding a flight to New York a week ago, hugs his daughter goodbye in Erbil, the capital of the Kurdish region in northern Iraq February 4, 2017, before going to the airport to fly, on Turkish Airlines, to Nashville, Tennessee, their new home. Behnam Partopour, a Worcester Polytechnic Institute (WPI) student from Iran, is greeted by friends at Logan Airport after he cleared U.S. customs and immigration on an F1 student visa in Boston, Massachusetts, U.S. February 3, 2017. Partopour was originally turned away from a flight to the U.S. following U.S. President Donald Trump's executive order travel ban. Fuad Sharef, an Iraqi with an immigration visa who was prevented with his family from boarding a flight to New York a week ago, kisses his relatives goodbye at his home in Erbil, the capital of the Kurdish region in northern Iraq February 4, 2017, before going to the airport to fly, on Turkish Airlines, to Nashville, Tennessee, his new home. Fuad Sharef, an Iraqi with an immigration visa who was prevented with his family from boarding a flight to New York a week ago, hug his relatives goodbye at Erbil International Airport, Iraq February 4, 2017, to fly, on Turkish Airlines, to Nashville, Tennessee, their new home. Behnam Partopour, a Worcester Polytechnic Institute (WPI) student from Iran, is greeted by his sister Bahar (L) at Logan Airport after he cleared U.S. customs and immigration on an F1 student visa in Boston, Massachusetts, U.S. February 3, 2017. Partopour was originally turned away from a flight to the U.S. following U.S. President Donald Trump's executive order travel ban. Samira Asgari is greeted by a friend after she cleared U.S. customs and immigration in Boston, Massachusetts, U.S. February 3, 2017. Asgari is an Iranian scientist who had obtained a visa to conduct research at Brigham and Women's Hospital and was twice prevented from entering the United States under President Trump's executive order travel ban. Banah Alhanfy, from Ira, is hugged and handed a rose after arriving at Logan International Airport in Boston on Feb. 3, 2017. Banah was initially not allowed to enter the US after President Donald Trump's travel ban. Massachusetts Institute of Technology student Kiki Rahmati, from Iran, hugs someone that met her at Logan International Airport in Boston on Feb. 3, 2017. She was initially not allowed to enter the US after President Donald Trump's travel ban. Dr. Muhamad Alhaj Moustafa, a Syrian citizen, embraces his wife Nabil Alhaffar, also a Syrian citizen, after she returned from a trip to Doha but was denied re-entry in January, at the international arrivals hall at Washington Dulles International Airport February 6, 2017 in Dulles, Virginia. A US appeals court has rejected a government request to immediately reinstate US President Donald Trump's controversial immigration ban -- the latest twist in what could be a long, high-stakes legal battle. Salwa Tabiedi greets her son Hussamedin Agabani, a Sudanese citizen who was arriving in the United States for the first time, at the international arrivals hall at Washington Dulles International Airport February 6, 2017 in Dulles, Virginia. Nazanin Zinouri, an Iranian engineer, is received by supporters at the Greenville Spartanburg Airport February 6, 2017 in Greenville, South Carolina. Zinouri, a Clemson graduate, works for a technology firm in Greenville, South Carolina and has lived in the United States for the last seven years. While attempting to return to South Carolina after a recent trip visiting family in Iran, she had been taken off her flight in Dubai as a result of the recent travel and immigration ban ordered by President Donald Trump. Shanez Tabarsi (L) is greeted by her daughter Negin after traveling to the U.S. from Iran following a federal court's temporary stay of U.S. President Donald Trump's executive order travel ban at Logan Airport in Boston, Massachusetts, U.S. February 6, 2017. Ali Alghazali, 13, a Yemeni who was previously prevented from boarding a plane to the U.S. following U.S. President Donald Trump's executive order on travel ban, hugs his uncle Saleh Alghazali, upon Ali's arrival at Terminal 4 at JFK airport in Queens, New York City, New York, U.S. February 5, 2017. Najmia Abdishakur (R), a Somali national who was delayed entry to the U.S. because of the recent travel ban, is greeted by her mother Zahra Warsma (L) at Washington Dulles International Airport in Chantilly, Virginia, U.S. February 6, 2017. Mustafa Aidid (center R), a Somali national who was delayed entry into the U.S. because of the recent travel ban, is reunited with his brother Taha Aidid (center L) at Washington Dulles International Airport in Chantilly, Virginia, U.S. February 6, 2017. Ammar Aquel Mohammed Aziz (R), hugs his father Aquel (2nd R), as his brother Tareq (L) hugs his uncle Jamil Assa (2nd L) after the brothers arrived from Yemen at Dulles International airport on February 6, 2017 in Washington, DC. The brothers were prohibited from entering the U.S. a week ago due to tightened immigration policies established by the Trump administration, but were able to travel freely this week following a court injunction halting the implementation of the immigration policy. The choice words appeared to be pointed squarely at Democrats who have joined activists, lawyers and immigrant rights groups in condemning what they claim is a far more sweeping and indiscriminate approach to immigration enforcement under the new president. Critics claim that emboldened immigration agents now target undocumented residents who have no criminal record and conduct raids around places such as courthouses and schools with greater frequency. Some lawmakers' outrage with DHS took a personal turn when House Democrats openly griped about Kelly's "dismissive" tone and vague answers on the Trump administration's immigration policies during a meeting he had with them last month. "This is not boot camp, this is not newly inducted members of the Marine Corps," Congressman Joe Crowley, a New York Democrat, told reporters at the time, making a reference to Kelly's military background. "These are experienced lawmakers who understand the law, understand the complexities of the law and also understand the job that the secretary has to carry out the law." Kelly, during his speech Tuesday, made it clear that he intends to do just that. "We will never apologize for enforcing and upholding the law," he said. "We will never apologize for carrying out our mission. We will never apologize for making our country more secure." 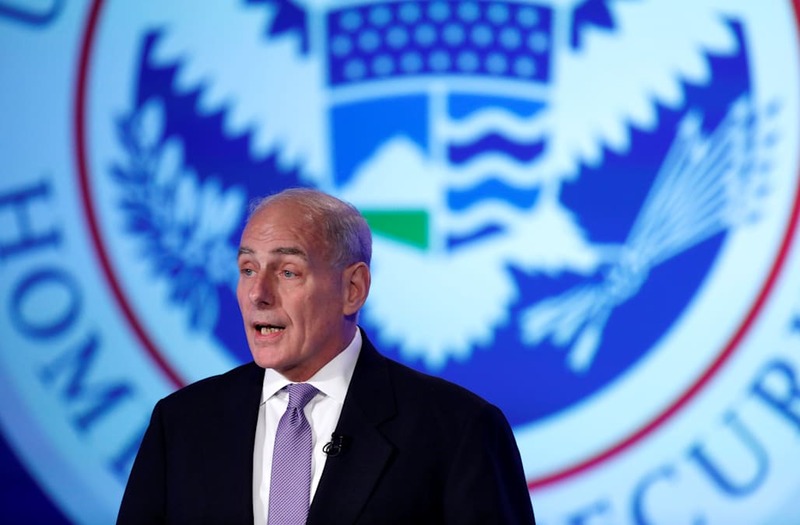 The post Homeland Security Chief To Critics: 'Shut Up' appeared first on Vocativ.